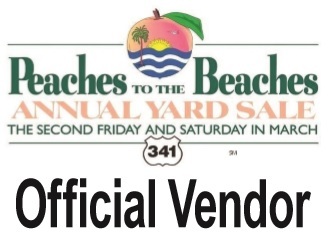 To be listed as an official part of the Peaches to the Beaches Yard Sale, the County's Chamber, Tourism Office, CVB, City or Development Authority must be a member of Explore Hwy 341, Inc. and also appoint a Peaches to the Beaches Community Coordinator. To become a member of Explore Hwy 341, Inc. click here. Explore Hwy 341, Inc. (EH341) is the owner of the Peaches to the Beaches Yard Sale. In 2013, GIPA had the Peaches to the Beaches names and logos service marked through the State of Georgia. In 2018 GIPA transferred ownership of these service marks to Explore Hwy 341, Inc. Any unauthorized use of the logos or names is an infringment upon EH341's ownership of them. CLICK HERE for information about how to become an official vendor. The Peaches to the Beaches Yard Sale was established in 2005, by a former Golden Isles Parkway Association, Inc.'s (GIPA) President, Evelyn Simmons. In 2018, GIPA transferred ownership, trade marks and service marks to Explore Hwy 341, Inc (EH341). The yard sale features official vendors selling everything from antiques, locally crafted items, food and the traditional yard sale fare. Official yard sites range from multi-organizational group sites to the official individual sites. A special "Official Site" banner or "Official Vendor" yard signs identifies these sites. 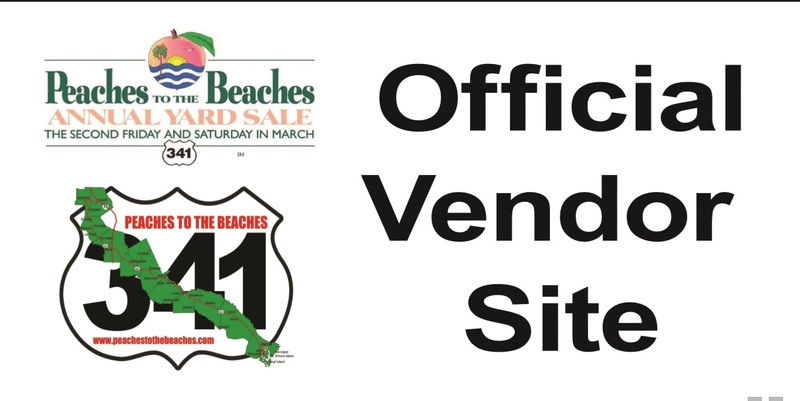 As you are traveling during this event, look for the The Official Site Banners and Official Vendor Yard Signs which will be located along Hwy 341 for places to stop and shop! Shoppers are encouraged to only shop at the "Official" vendor/sites as these vendors support this worthwhile event and make it possible for EH341 to continue promoting and organizing this event each year.For this event, vendors can rent official space, signs and banners to designate that they are an official part of the event.